Would you like to add hunting and tracking to your marksmanship skills? Maybe you are already a good hunter and want to spend more time with fellow hunters, or hunt to feed your family. You might want to support organised efforts to control feral animals. If so, read on. Alpine believes in ethical hunting. A good hunter is a humane hunter. It is impossible to hunt humanely if you are not a good shot. Our field rifle shoots are designed to enhance your abilities in shot placement from various shooting positions. Being able to shoot from various positions gives the confidence to take those difficult shots in hunting situations, ensuring that the animal will be humanely dispatched. 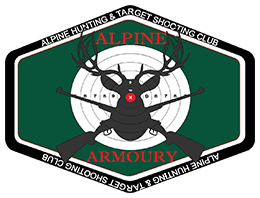 Alpine is an Approved Hunting Organisation. The types of licence needed to do various types of hunting are set out here. If you are interested in Restricted Game Hunting, you will need an R-Licence. As an accredited Hunter LEAP provider, Alpine delivers the assessment course and test needed for an R-Licence. The fee to sit for the open-book test is $30, payable at the Alpine Armoury website. Before you can join an Alpine hunt, you must be able to score a minimum 140 out of 175 in the PR5 competition at 100 metres. Only when your score card has been marked “hunt qualified” may you take part in a Club-organised hunting trip. 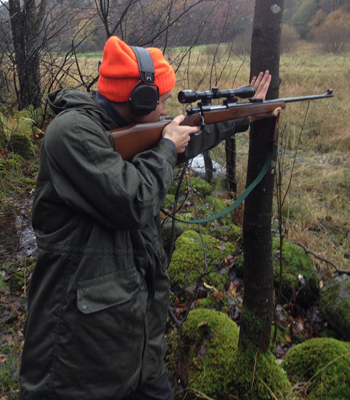 To join a Club hunt you must be a member of Alpine and have attended at least three recent Saturday target shoots using the rifle you intend to use on the hunt or a similar rifle. You must carefully read, and agree to comply with, our Hunters’ Code. Participants in Alpine hunts are responsible for their own transport, usually a four-wheel-drive. (We have generally have spare seating for members prepared to share fuel costs.) You will also need food and camping equipment, a UHF two-way radio, a blaze orange vest and/or cap, a compass, and wet weather gear. Advance booking is essential. Numbers are limited and active Alpine members receive preference. Costs: Minimum advance payment is $30. Hunts on private land attract a fee of $30 per day; hunts on public land are $30 per trip. These fees are used by Alpine to improve its services to members. To take part in our sambar hunts in Victoria, you must obtain a Victorian game licence (about $40 a year). If you are interested in hunting with Alpine, make sure you read the tips on our Gear page for advice on rifles and calibres, scopes, equipment, and clothing. For more detailed info about Alpine hunts, what’s required and how to prepare, visit Hunting & Gear Page. The Sporting Shooters Association of Australia (NSW) has partnered with the National Parks and Wildlife Service in a trial program using recreational hunters to help eliminate feral animals from 12 national parks in NSW. NPWS and SSAA NSW have put considerable effort into developing the program, and both bodies are fully committed to the success of the three-year trial. After doing a training course, volunteers become Qualified Supplementary Pest Control Volunteers. They can then apply their passion for shooting and hunting to the benefit of native flora and fauna. To take part, you must register an expression of interest on the SSAA NSW website and attend an information session. Click here and follow the instructions to register your interest. Once you have done so, please email alpinehtsc /at/ icloud.com so we know which Alpine members have chosen to get involved. More than 350 animal and plant species, populations and communities in NSW are believed to be threatened by the impacts of pest animals. Qualified shooters can support efforts to control pest animals by becoming Supplementary Pest Control Volunteers. For more details see the outline at left and the NSW Environment Office website; for videos on the program click here.